- Cropped Design featuring a round neckline, short sleeves, and Simple style. - Really comfortable gym and running crop top that doesn't cling or cause friction anywhere. 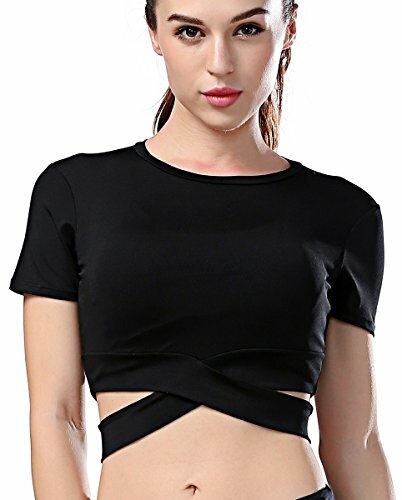 - Recommended to wear with this crop top when doing sports, for jogging, fitness, running, gym, yoga. Also can be an everyday outfit matching with your pants or skirts. Nothing could be better than it if you need a shirt for yoga, running, playing basketball etc. - Ideal for everyday active lifestyle like Sports, Exercise & Fitness, Yoga, Walking & jogging, Cycling, Boxing, Bowling, Tenis, etc. If you have any questions about this product by Campeak, contact us by completing and submitting the form below. If you are looking for a specif part number, please include it with your message.